Microsoft's another big release of office is Comming Soon i.e. Office 2019 with SharePoint 2019. Microsoft's current Office version is 2016 and now they are releasing Office 2019. As per Microsoft, Office 2019 will be released in second half of 2018 and this could be a Preview version. Office 2019 will include Apps for Word, Excel, PowerPoint and Outlook also it will include server versions of SharePoint 2019. Microsoft Excel will get updated formulas and charts. Powerpoint will get new visual features. 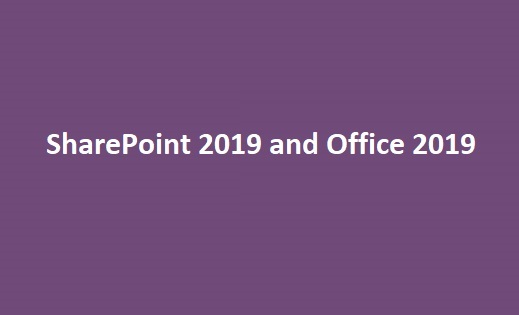 We will explore the things related to Office 2019 and SharePoint 2019 in upcoming blogs once I will get an update on this. There are several new web parts announced in SharePoint 2019. Some of the new web parts are - Microsoft Forms, Planner, 3D file viewer web part. I think Microsoft will surely provide exciting features in SharePoint 2019 for developers. So let's wait and watch how SharePoint 2019 will cover the market after its release. Till then stay tuned on SharePointCafe.Net to get all new features of SharePoint 2019.